travel with infants--step 1: getting to the aircraft. traveling with infants is easier than you think. infants often sleep much of the flight so you can at least breathe once you settle in your seat. the toughest part is getting through security, so that's why i start here. do yourself a favor and check your suitcase. even if you have to pay a checked bag fee, it's worth it. can you imagine lifting it into the overhead bin while juggling your infant? even if you have baby in a carrier, it will be nearly impossible to safely lift that bag. yes, it would be nice if someone helped you, but you can't count on that. simplify the trip in any area you can. i carry on only a backpack and diaper bag (or combine the two). you can check your car seat (airlines do not charge for car seats/pack 'n' plays/strollers), or do what I do: use gogobabyz wheelz. gogobabyz has amazing products to assist in air travel and if you fly with the baby more than once a year, the cost is *DEFINITELY* worth it! 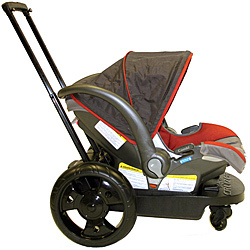 the infant cruizer comes with an adapter to allow you to use it with a convertible car seat once the baby gets bigger so it's a great investment. even if the baby will be in your lap, not in her own seat, it's nice to have wheels to push the baby or the bags through the airport. Leave the wheels attached and gate check if the baby does not have a seat. many large airports have a line at security dedicated to families with children. look for this line where there will be less pressure to rush from the passengers in line behind you. it's nice to have baby in a front pack/sling/or infant carrier while setting everything on the scanner belt so you can have both hands free. -remove your shoes and yes, baby's shoes if he is wearing them. 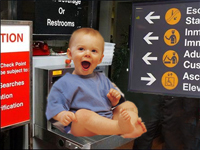 (don't bother with shoes on your infant for airport travel. if the look of shoes is important to you, get trumpette socks. -if you have the car seat and wheels, detach the wheels and put both through the scanner. -last, remove baby from carrier and put carrier on the belt. 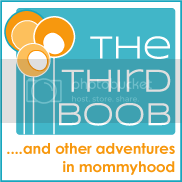 you made it though the toughest part of travel with an infant! next week I'll show you how i pack for the airplane with an infant. 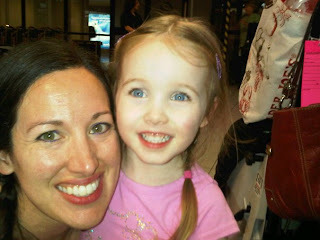 stay tuned: beth will be blogging with us for the next few weeks sharing her *fabulous* airplane travel tips for infants and toddlers both! beth is a flight attendant for a major airline and mom to a curious explorer, "e". "e" earned elite status at the airline at 20 months. in her blog, "cloud surfing kids", beth gives helpful tips and insight based on her experiences. Love the tips,and especially love that there are helpful products and pictures of them. I was a crew member for many years, and I've never seen these! cute pic of Mother &daughter, too.